Relatively early in their explorations, Tyler and Project TRUE discovered a shadow with some highly useful peculiarities. At first it appeared to be simply a spacious and comfortable cave system, possibly useful as a supply depot. Then it was discovered that the caves opened into a vast cavern, an immense sphere ten miles in diameter. The entirety of the interior was covered with lush forests, and verdant grassland, all illuminated by a bright star suspended in the center of the sphere. The most most unusual feature: no matter where you stood on the interior surface, 'up' was the center of the sphere. With over 300 square miles of usable space, the sphere could easily support a population of nearly ten thousand individuals, all of whom could be comfortably housed in the cave systems beneath the surface of the sphere. A task force was dispatched to set up a permanent, off-world base. The intent was to create a more secure staging and research area for extra-universal expeditions, but it has now become an evacuation site for the surviving inhabitants of Tyler's home shadow. The current population is approximately 2,500 people. Roughly a third were civilians, evacuated to Refuge in the days leading up to the disaster. The rest are a fairly even split between those members of Project TRUE who were off-world when the disaster hit, or members of CSW who were at the main base and able to get out. Politically, Refuge Base is a military outpost under the command of General Cyrus Teed. It is not a simple military dictatorship. A better description might be "Parliamentary Meritocracy." Teed chosen as leader after a council of officers reviewed all personnel and voted on their best choices based on administrative ability. He has proven to be very capable. 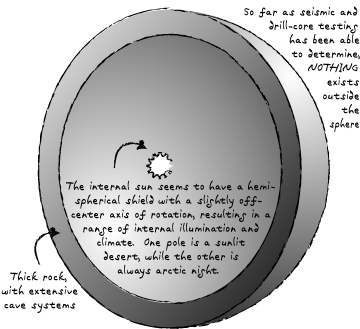 Apart from the peculiarity with the spherical cavern and the unsupported sun, all physics and technology are identical to Tyler's home shadow: everything up to steam power works normally. Electricity is a scientific curiosity, too unpredictable to be used to power anything. Conjuration and Sorcery are matters of fiction and do not function. Trump works, but only in very limited areas. The only access into or out of the shadow is via Trump. All arrivals and departures must take place in a single, heavily guarded cavern. While this does help security, it can also be something of a problem when attempting to move large numbers of people.